The orthodontic specialty practice of Dr. Aly Kanani and Associates providing specialized orthodontic treatment including Invisalign and braces for children, teenagers, and adults. 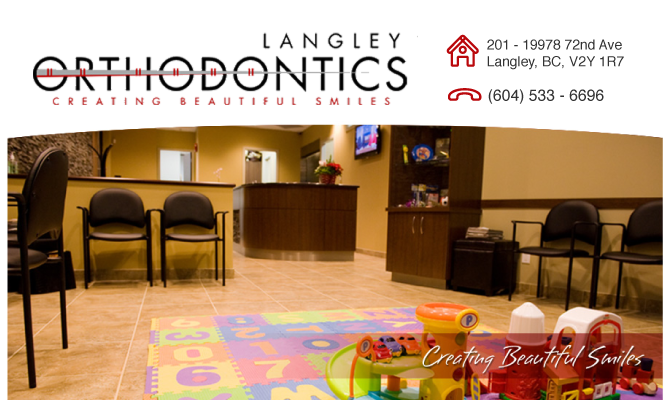 Langley Orthodontics utilizes sophisticated diagnostic and treatment techniques in line with the orthodontic industry. We are committed to excellence in attaining our orthodontic results. Equally as important, we are committed to the creation of an environment that is open, friendly and a fun place to be. When someone leaves our office, we want them to feel better about themselves. We dedicate our time, talents and energy to this objective. Langley Orthodontics utilizes the Innovation Braces System. Innovation braces smiles are full, natural 10-tooth smiles achieved with light biologically-sensible forces, many times without the use palatal expanders. Dr. Aly Kanani is also an experienced Invisalign® and Invisalign Teen® Provider. Invisalign® treatment is a technique that straightens your teeth without braces, using a series of clear, removable aligners that are custom-modeled to fit your teeth. Creating beautiful, lasting smiles is our business!